The 2012 phenomenon is a present-day cultural meme proposing that cataclysmic or transformative events will occur in the year 2012. The forecast is based primarily on what is claimed to be the end-date of the Mesoamerican Long Count calendar, which is presented as lasting 5,125 years and as terminating on December 21 or 23, 2012. Much speculation has attached itself to this date, including interpretations of assorted legends, scriptures, numerological constructions and prophecies, and alleged channeling from extraterrestrials. A New Age interpretation of this transition posits that, during this time, the planet and its inhabitants may undergo a positive physical or spiritual transformation, and that 2012 may mark the beginning of a new era. Conversely, some believe that the 2012 date marks the beginning of an apocalypse. The 2012 doomsday prediction idea has been disseminated in numerous books and TV documentaries, and has spread around the world as an Internet meme through websites and discussion groups. The idea of a global event occurring in 2012 based on any interpretation of the Mesoamerican Long Count calendar is rejected as pseudoscience by the scientific community, and as misrepresentative of Maya history by Mayanist scholars. The world didn't end in 2012 but you can see the hysteria it created. 2012 end of the world is the most widely discussed mysterious year as per the research made by many scientists. A number of experts throughout the world predict that all organic life on Earth will face culmination on December 21 2012. Some believe that it could be due to human's acts, while others believe that the ultimate culmination could be due to some natural phenomenon, such as earthquakes, volcanic eruptions and so on. The Mayans were the first people to predict that the year 2012 will be the end of life on the planet. The Mayans were extremely skilled at building accurate astrological apparatus from stone and Sacrificing Virgins. The Mayan Calendar foresees about the end of life on Earth on December 21 2012. Base on the calendars of the great Mesoamerican civilizations, known as being the most precise on Earth, we are only 4 years away from the end of the world 2012. These great astrologists, the Mayans, have discovered 3 thousand years ago, that the Earth's Axe oscillates and changes its position every 26 thousand years and as a result the positions of the neighboring stars change all the time. Even as we speak, we are approaching the end of this big cycle, which in the eyes of the Mayan civilization coincides with the end of the world predicted for December 2012. In general, solar storms have been entering the earth with lots of radiation energy, thereby knocking the power grids as well as destroying satellites. This particular activity is predicted to get even worse and this problem will reach its top on December 21 2012. Volcanic eruptions are predicted to be the major natural disaster that will end the life on Earth. The Yellowstone volcano is said to have an erupting pattern for every 650,000 years. The pressure under this volcano is building continuously. Many geologists foresee that this volcano is ready for a massive bang in the 2012 end of the world. 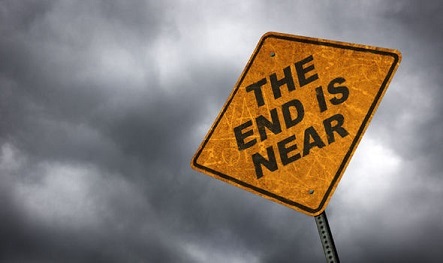 According to the calculations made by expert scientists, it is anticipated that the Earth will face major destruction in 2012 end of the world. To make the matter even worse, their predictions tells that all human beings will die very shortly with 99% certainty. An even weirder thing is that in the magnetic field of the Earth have been reported holes similar to ozone holes. It seems that the magnetic poles will soon reverse and this will affect our planet's capacity to defend against heavy objects that will attack us in the future. The planetary alignment could lead to a huge solar storm. Also scientists think that the solar system has just entered in an interstellar node with a very powerful energy and electromagnetic activity. The entire solar system is reacting, trying to adapt to the new situation. They also say that the climax will be in 2012 end of the world! If the collision will be violent, the electromagnetic activity will unleash a huge quantity of energy in our direction. Comets and asteroids could suffer oscillations in their orbits and the risk of collisions will increase. What will really happen? Is the "end of the world 2012" Is the prophecy really true? We don't know for sure because the facts are a little ambiguous, we'll just have to wait and see. There is a lot of talk going on today regarding the events that is yet to happen in the year 2012. Well, December 21, 2012 is considered to be the marking point of all events predicted by many ancient people as well as modern scientists. Starting from global illumination to catastrophe on the earth, many ancients have predicted a lot of things. Ancient Mayans have an incredible understanding of the solar system that eventually led them to discover the long count calendar, namely The Mayan Calendar for December 12. 2012. People who have a strong belief over the wisdom of the ancient culture will be fascinated to know more about this aspect. However, people in the modern world will take time to realize the significance of 2012 planet alignment. The theory held by ancient Mayan prophecies as well as our modern day predictions regarding the 2012 planet alignment is often called as pole shifting. This theory deals with the changes in the North and South Pole that could spell world disaster, such giant tsunamis destroying the entire cities, hurricanes, earthquakes and chaos everywhere. All these predictions about 2012 planet alignment have been prophesied for several years by a number of ancient civilizations, such as the Mayans, Zulus and many others. There are many other predictions just like the 2012 planet alignment. Whatever it may be, getting prepared for the future is always better rather than anticipating the event with no preparation. This is highly essential for survival of human beings on Earth. The year 2012 is considered to be a mysterious year. Nobody is aware of what is going to happen in the year 2012. Many prophecies have included this year as it is very important spiritually. Most of us still can predict as to what will happen before or after 2012. Well, if the predictions are true, then 1 out of 3 fundamental situations will result either before 2012 or after 2012. 1. Human beings are sure to undergo a spiritual evolutionary transition where Divine and Spiritual reality will be experienced. Even focus and abilities will be based spiritually rather than materially based. 2. The Planet Earth will eventually enter into the next evolutionary level or to the 4th destiny. In such a case, all the organic life will die and cease to exist on the Earth. All organic life on the planet will also undergo transition to the 5th destiny, where life will continue as before in the spiritual body based on the spiritual progress. 3. The Planet Earth will experience huge cataclysmic physical trauma that will eventually destroy all the lives on the planet. If at all this physical trauma takes place, then the all organic life on the Planet will enter into the next evolutionary level. All the sufferings are a direct consequence of the thoughts as well as actions of human beings. The most obvious outcome will be the evolution of human beings into "Homo Spirits". So the fact about December 2012 is still a big matter of question among many people. Are you aware of the theories of 2012 Mayan Prophecies? As far as everyone is concerned, a theory remains to be a theory always, unless and until an awful event occurs in our real life. This goes for the 2012 theory as well. The Mayan Calendar is an extremely accurate measurement of cycles and various events. It contains a lot about Mayan culture as well as the controversial interpretation of various events. According to the 2012 Mayan Prophecies, the culmination of the entire world will occur on December 12, 2012. This prediction was based on the meso-american start charting that began in the early 680 B.C. The Mayans are generally very skilled in tracking winter solstice and talented in creating calendars. The Mayans are extremely intelligent peoples, capable of developing calendars of their own. It is now called as The Long Count. They generally use observations in order to calculate future events such as movements of millions of stars across the sky. The effect of earth's wobbling when it spins on its own axis was first discovered by the Ancient Mayans. There are many predictions that say that the world will come to an end due to various disasters, such as cosmic catastrophe, volcanic eruptions, tsunami and other extraordinary events on December 12, 2012. There are certain important facts about this theory to be considered. It is said that 2012 isn't a prophecy but rather a prediction. Another important consideration deals with the life cycles of the planet earth. It is said that life evolves in cycles and that there are lots of evidence showing a huge range of fossils. So keep in mind, whatever is going to happen will happen for sure. Choose life! Michel de Nostredame (aka Nostradamus) was a 16th-century French "seer." We don't have many seers these days. Nostradamus studied astrology and various "occult" sciences and used those to predict the future. He's best known for The Prophecies, a collection of French quatrains published in 1555. So are these prophecies worthy predictions of the future or merely vague observations retrofitted to match past events? Be received as divine prayers"
You remember the French Revolution, right? The peasants ("the enslaved populace") rising to power, the aristocracy taken down and beheadedÂ (the "headless idiots," now "princes and lords ... held captive in prisons"). In another verse, the "great wall" falling is said to mean the storming of the Bastille. It's a bit of a stretch, right? It's possible that Nostradamus saw the coming of a peasant uprising through completely non-astrological or occult means, but through his own eyes as he saw the contrast between aristocrat and commoner in 16th-century France. Look, just because you've never heard of the Great London Fire of 1666 doesn't mean it wasn't a really big deal. It pretty much obliterated all of medieval London ("the ancient lady") within the old Roman walls. Only six deaths were recorded (hence "the six" in the second line), though commoners' deaths may not have been recorded at the time. The fire, which started in a baker's shop, burned for three days straight. If only someone had passed along a copy of Nostadamus' book, maybe Londoners might have known it was coming. OK, pay careful attention here: The father of Princess Diana's boyfriend, Dodi Al-Fayed, was named Mohamed ("the Prophet" - it wasn't his surname, but never mind that). Did Diana's death deliver "a great people from subjection"? Maybe not, but we can all agree that the British are a great people, right? The fact alone that Diana's name is in the text speaks a lot to Nostradamus followers -- specific names are, in general, a rarity in Nostradamus' works. Did he really mean NEW Orleans? Hmm...The shaking of land and sea might describe the hurricane (well, the shaking of the sea would). Could the people with foreign tongues be aid workers from other parts of the world, or other parts of the country? But what are Tours, Blois, Angers, Reims and Nantes doing there? Pre-Katrina, this prophecy was originally thought to refer to France. Maybe it still should. Conflict at Reims, London and a pestilence in Tuscany. Thunderbolts and gunshots: not terribly dissimilar. And the great man was struck down in the day, as John F. Kennedy was. The other falling at nighttime would be Bobby Kennedy (five years later). Now, it can work if you want it to, but do you really think a Secret Service agent reading that passage in November 1963 would have cause to be concerned? And what of Reims, London and Tuscany? Like many surnames, Louis Pasteur's probably once indicated a profession. Pasteur, in French, could also mean pastor, so some argue that this bit of Nostradamian prose could just be about any old priest. Others call it a shout-out to the man who studied microbial decay, brought you spoilage-resistant milk and found a vaccine for rabies. No one doubts he deserved the props. You be the judge. OK, this one is hard to dispute. Let's face it. It's an accurate description of the atomic bombings of Hiroshima and Nagasaki. "Scourges the like of which was never seen," people "crying to the great immortal God." With that said, this verse is accurate because it cheats a bit on the specifics. Critics charge that it's so vague that it could also be used to describe a whole host of wartime atrocities during any of many wars that took place between Nostradamus' time in the 16th century and today ... or even the future. These two verses may in fact describe World War II and Hitler ... or not. Was the most notable bit about Hitler his impoverished upbringing? What about the genocidal, megalomaniacal tendencies? Don't those deserve something? Much of the talk of Nostradamus' prophecy of Hitler may come from his use, in the original text, of the Latin word "Hister" to describe the Danube. Trust us, he was talking about a river, not a dictator: no self-respecting prophet would make such an egregious spelling error. Well, two great rocks could be two towers, right? But would you say those towers were warring? If you read this verse before Sept. 11, you might assume it referred to an earthquake or volcanic eruption. Earthshaking fire, tremors, rocks warring (in other words, continental plates colliding), but who really knows. Back when Nostradamus wrote those lines, skyscrapers like the Twin Towers, jumbo jets like the ones that hit them and cities like modern-day New York were probably unthinkable and unimaginable, so if he foresaw these events, would he have even known what he was seeing? Remember when the world was going to end in 1994? The doomsayers always warn that Nostradamus said the world was going to end and he NEVER GOT ANYTHING WRONG. These days, 2012's the trendiest day for end-of-world prophecies. Specifically, it's Dec. 21, 2012. Believe it if you want. One thing is clear: Nostradamus himself wrote that his prophecies only went as far forward as the year 3797. Does that mean the world will end late in the 38th century? Only time will tell.